They have two colour phases, either grey or reddish brown, and they can be either plain or have faintly spotted markings. Their underside, chest and throat are light coloured or white and they have small white patches above their eyes. Their small ears are rounded and dark in colour and their long tail has a distinctive central stripe and a black or brown tip. 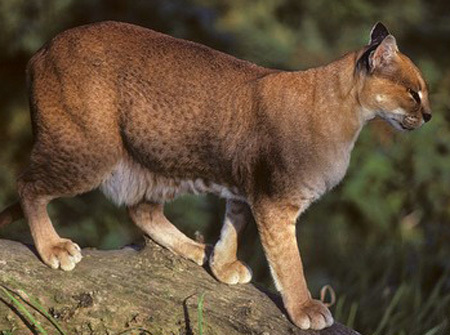 African Golden Cats are agile and are good climbers. They also have a range of vocalizations that they are able to use for communication. African Golden Cats are found in the tropical rainforests of western and central Africa at altitudes below 3,600 m (11,810 ft). 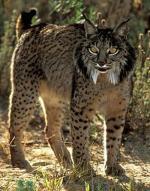 They are solitary and can be active during the day or night, depending on their location. 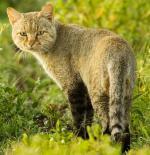 African Golden Cats mainly feed on rodents, birds, hyraxes, small antelope, monkeys and domestic livestock. After a gestation period of 75 - 78 days, 1 - 2 young are born. The youngsters are born with their eyes closed, but they grow quickly and after 6 or 7 days they open their eyes and at 10 days old they are walking. They are weaned at 6 - 8 weeks and they reach sexual maturity at 18 months old. Humans are predators of African Golden Cats. African Golden Cats are the only member of the genus Profelis, but they are closely related to the caracal and the serval.